The bore is the shape of the inside of the tube of a wind instrument. Many instruments, like the oboe, have a conical bore. Other instruments, such as the concert flute, have a cylindrical bore. You asked for it, and now I’m delivering! In this post, we are going to look at the differences between cylindrical and conical piccolo bores. If an instrument has a cylindrical bore, that means that the tube does not get larger or smaller from one end to the other. The best example for this is the modern metal flute. If you measure the diameter of a flute at the tenon between the headjoint and body, you will find the same measurement at the end of the foot joint. The headjoint itself does taper slightly, but that is beside the point for this post. A cylindrical bore gives a fuller sound in the low register. Since the tube diameter does not get smaller at the end, the sound has more space to resonate. Cylindrical bores also tend to have a more even scale, and the harmonics are closer to where they should be. Cylindrical bore piccolos are also more similarly built to flutes than conical bore piccolos. Not many piccolos are cylindrical bore. That makes these instruments hard to find. Most cylindrical bore piccolos are made of metal, which is not usually a preferred material. Because the low register is so strong, other tuning issues, particularly in the upper range, can arise. That means more time practicing or searching for alternate fingerings. A conical bore instrument has one end that is noticeably smaller or larger than the other. Within the instrument, the tube tapers like a cone. In some instruments, like the oboe, it gets bigger as you reach the end of the instrument. The case is reversed with the piccolo; the end of the instrument is smaller than at the top. Conical bore piccolos are plentiful. Most piccolo models are made with a conical bore. 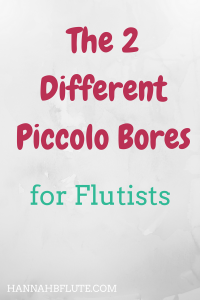 If you only plan to learn how to play one bore, go for a piccolo with a conical bore. Piccolos with a conical bore have fewer tuning issues than their cylindrical counterparts. And since most professionals and teachers have played a conical bore piccolo, more information and alternate fingerings are readily available. The footjoint end of a conical piccolo is smaller than on a cylindrical piccolo, and that results in a smaller sound in the low register. Some piccolos, like those by Yamaha, really struggle in the low range. One reason that the flute is cylindrical is because of various developments that helped the flute become a better instrument. However, the piccolo has been left in the dust. It is almost as if the piccolo is stuck in the 19th century, pre Boehm. In most cases, you cannot request a certain bore for a piccolo. Some models are made with a cylindrical bore, others with a conical bore. While you can change certain specs on a piccolo, like adding a split E, that is not the case for the bore. Rather than choosing a piccolo because of its bore shape, choose a piccolo based on materials, workmanship, and how it fits you. I have played an owned both a cylindrical bore piccolo and a conical bore piccolo, and they both play well. It’s less a question of the shape and more a question of whether or not you can get a good sound out. Have you tried both cylindrical and conical bore piccolos? Which piccolo bore did you prefer? Let me know in the comments! In 1986, I got a touring gig. On my way to the airport, I stopped and tried piccolos, and I bought the one that was the loudest. It was a conical bore Gemeinhardt, grenadilla wood, and it could really shriek! I had to get used to an unusually wide C-D interval over the “break,” but night after night, without fail, the high G# in the Toreador song was heard by all. Later, I had a chance to hear what it did with Tschaikovsky Sym. 4 and Bernstein Sym. 2. Bitter complaints from the 2nd violin section! Wow! Piccolo is hard, but (as I’m sure you know) if you work at it, you will get better! And what 2nd violin section doesn’t get annoyed by the piccolo? !